At the start of every season, we create an outdoor fun list. Together, we dream up some things we’d like to do, write those ideas down and then try to make them happen. Some of the ideas on our summer outdoor bucket list are simple, but others require more time – things like cherry picking or fishing. Of course, more than any other time of year, we also plan for lots of downtime to make room in our lives for enjoying summer’s simple pleasures. Instead of sharing what’s on our family’s summer outdoor bucket list this year (you can see our 2010 and 2012 lists for past examples), I thought I’d share some ideas to help you make your own. 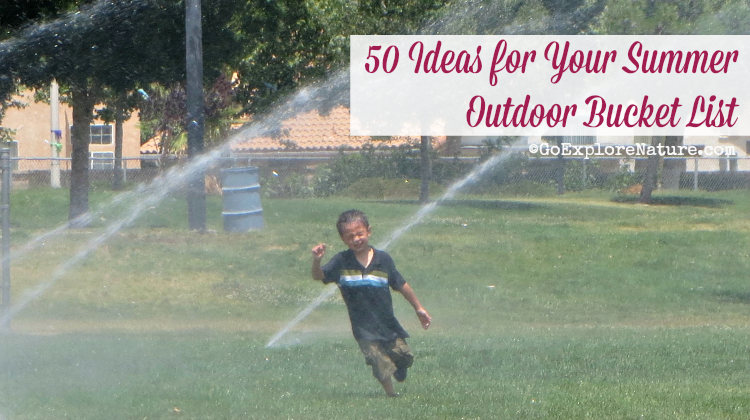 These 50 ideas for your summer outdoor bucket list should keep the kids entertained and inspired all season long. Need a few more ideas? Check out my summer outdoor fun board on Pinterest, where I collect ideas for summer play and summer bucket lists from around the web. And don’t miss your A-to-Z guide to summer backyard nature fun. Thanks, Mike! Hope you guys have a wonderful summer! Diggin it.. This is a great list! Thanks for stopping by, Lora! Happy summer! I love your summer outdoor bucket list! What a great idea for fun-filled summer adventures with the kids. Thank you for sharing.